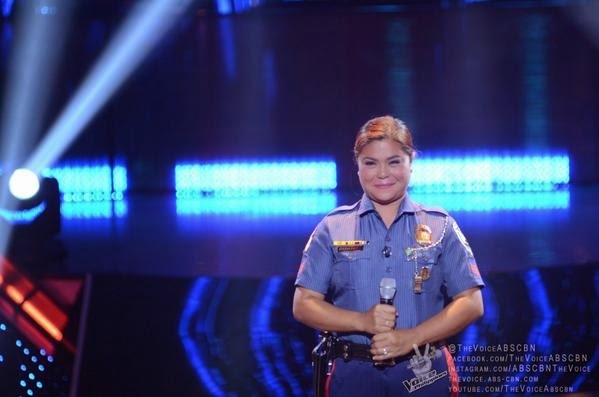 Manila, Philippines - Policewoman Jannet Cadayona performed Eva Eugenio hit "Tukso" during the Blind Auditions premiere of ABS-CBN's best vocal competition 'The Voice of the Philippines Season 2 aired on Sunday, October 26, 2014. The 40-year old lady cop from Samar impressed Coach apl.de.ap who has turned his red chair. The policewoman was one of the featured artists in the preview of 'The Voice PH' Blind Auditions. In the pilot episode, Lea Salonga and Sarah Geronimo sang "Run The World" while Apl.de.ap and Bamboo performed "Ten Feet Tall" to formally open the new season. The Sunday's premiere episode of 'The Voice of the Philippines' Season 2 dominates online conversations with 'The Voice', 'Mitoy' and #TheVoicePHisBack among the trending topics.